Looking to Hire a Skip Bin in Melbourne? Big Bin Hire can help with all your questions and queries and make it easy for you to hire a skip bin in Melbourne today. We provide skip bin hire across Melbourne. 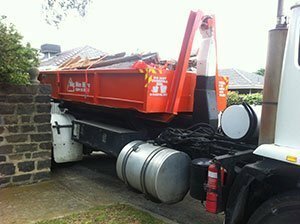 We are based in the Western Suburbs, but regularly service other suburbs of Melbourne with skip bin hire. If you are a hiring a skip bin for the first time, there are a few things we would suggest before you start ringing skip bin companies for quotes. Try and assess how much rubbish you have to place in the skip bin – some customers find this difficult, but try and imagine your waste laid out on the ground. Would your rubbish fit in an average car park space? If so, then you are looking at hiring at least a 4m3 skip bin. Taking the stress away with our hook lift skip bins available across Melbourne. If you are looking to hire more than one skip bin, is there any way you can sort your waste into categories and have one skip bin available for each waste type? This is a great way to save money. Have you looked into tip fees? On the surface, skip bin hire can seem expensive. But we can assure you it is much more affordable than you transporting your rubbish to the tip yourself. Think about tip fees, trailer hire, your time and effort…. suddenly skip bin hire fees seem cheap! Keep in mind that most tips don’t accept builder’s waste such as concrete, sand, soil and rubble and will charge extra for unsorted waste. Moonee Valley Transfer Station charge $430 for a 3.65m3 tandem trailer (our prices for 4m3 skip bins start at $300). If you are living within 30km of Melbourne’s CBD, please call us for a skip bin quote. We regularly travel throughout Melbourne and can most likely help you with skip bin hire. Of course if you are living in Newport, Altona, Spotswood, Yarraville, Seddon, Footscray, Williamstown, Hoppers Crossing, Werribee or anywhere else in the heart of the western suburbs, please let us know if we can help with skip bin hire. We are most likely able to get you a skip bin within the hour. For further information please call on 1300 22 44 73. How much does Skip Bin Hire Cost?